PAINT YOUR OWN WOODEN SIGN, due to the extra costs associated with supplies required for this project you are not able to use any coupons, discounts or promotions towards this event. Please also read about the cancellations policy below for this event. You will need to select the design you would like to paint and select the corresponding design number from the drop down menu when you purchase your ticket. Please Note: This event is open to ages 12 and over. There is a full stencil for this wooden sign. 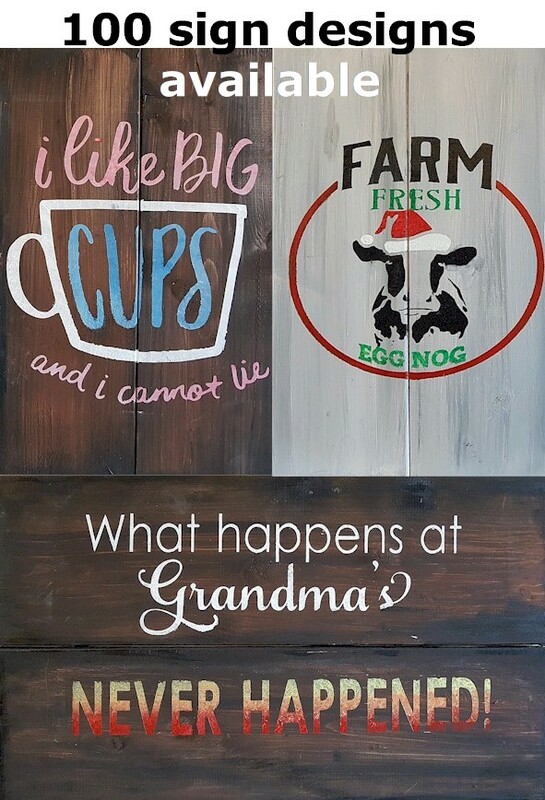 Wooden signs are 12" x 20" and you can pick from one of over 80 designs for you unique painting, you can also change background colours and foreground colours to make this a one of a kind sign. Event Info: Your admission includes everything needed to recreate the sign you pick. From wood boards to aprons, paints, brushes, stencils, tools and step-by-step instruction from local professional artist to complete your one of a kind unique sign. We do the set up and the cleanup. No stress for you. We just ask that you arrive early so that you can select your seat. If you are in a large group the earlier the better. This will give you time to get your drinks and any food you might like. Food & Drink: Drinks are not included in the event price. You will be able to purchase food and drink at your venue. You can visit our page for information on Triple B's or you can check out their website Triple B's for the menu, drink list and location. Cancellation Policy: Art and Wine is an entertainment event, much like a concert, dinner theater, or movie theater. Due to the uniqueness and one of kind nature of this event we are only able to accept cancellations or rescheduling if 1 week or more notice has been provided. Cancellations should be made via email or phone. We are unable to refund reservations if less than 7 weeks notice is given before the start date. You may reschedule your ticket to another DESIGN A SIGN event only as your stencil will have already been made up at the printers for you.